In my latest review with Snugpak I take the SJ3 jacket out in Autumn which is past its suited seasons as advertised by Snugpak. This jacket is designed for Spring and Summer rather than the colder months of Autumn or even what we would experience on the lower levels when wild camping on the mountains currently. For the review I was using a blue, large SJ3 and at 6ft 2 I found I had plenty of length on the body and arms. Although passed its advertised seasons for use, the conditions have been from -5 to 0 degrees in the wet or mountain tops with gusting winds on top and I have been very warm and comfortable wearing the SJ3. In fact, at times I’ve been to hot especially when climbing up the mountains in the first instances as my recent trip to North Wales. Climbing up Y Garn, Miners track and around Dinorwic quarry in all cases I started with the jacket on but half way up the climb I would have to take the jacket off. It would only be when we stopped for a break would I want it back on for wind protection. It’s very lightweight and compact. One of my favourite items from Snugpak is the ML6 smock which I am looking forward to digging back out again for Winter but the ML6 is very bulky and takes up a lot of space. The SJ range, certainly the SJ3 is smaller and better suited for long distance hiking and climbs with its stuff sac and light, fitted designer. Weighing in at 580g it’s a great down jacket and in Spring and Summer I can see it being useful for night times if not a great pillow in the stuff sac. 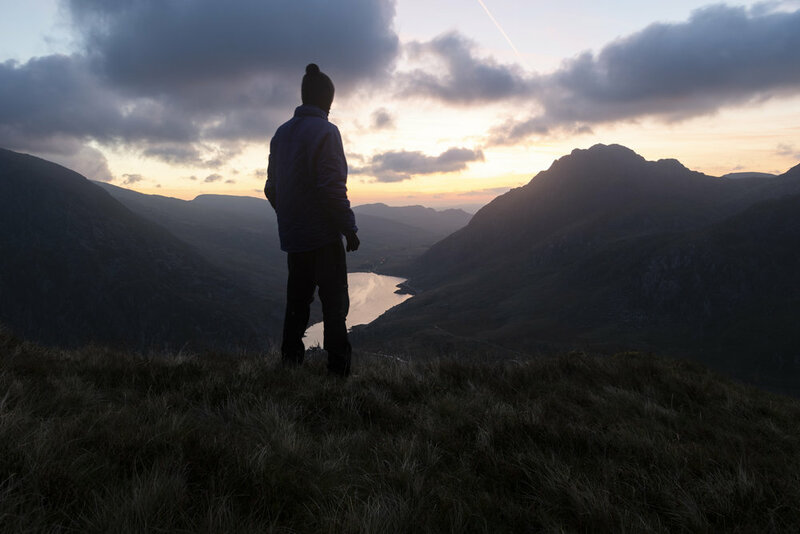 When the temperatures dropped below -5 while at llyn Caseg-Fraith in North Wales the combination of the Snugpak Impact Fleece with the SJ3 was the perfect combo. Wearing a pair of gloves, beanie hat and buff just to cover the extremities I was again very warm and had no issues staying out in the wind. On the neck and waist, the jacket can be adjusted to fit closer and give further protection, I didn’t use the waist adjustments but certainly the neck which was easy to use with a pull cord on the back. The neck has a good height and provides plenty of protection. The main zipper I had no issues with using in cold or wet conditions either or whilst wearing gloves. Now the SJ3 jacket comes with a hood built in which is compact and rolls away. I just kept the hood rolled away in the neck. Personally, I didn’t get on with this and found it a little flimsy and in strong winds found it blew off easily even after tying off the cinch points. On its own I wouldn’t rely on the hood but using the hood with a beanie hat or something to keep it tight on your head will dramatically reduce wind chill on the neck. Working down the jacket, the sleek design features two padded pockets both with YKK zippers to protect the contents inside. When you don’t have a rucksack on and a hip belt covering the pockets, they are very warm and provide plenty of protection. One of my zippers did loss the branded zip tassel but this does nothing to the pocket itself just one less branded item on the jacket. On the inside of the jacket is a larger chest pocket which can fit a small tablet, OS map or what I typically used it for was my phone and the stuff sac when not in use to keep it in a safe protected area when needed. Even when filled with a phone or map this pocket doesn’t feel one sided as there is no counter sided pocket to balance out the two sides. The cuffs of the jacket are great and have a double tie off both of which are elasticated to give plenty of stretch when needed. One lower down on the wrist and around the thumb loops which have a good size and give for larger gloves which can be used under the thumb loops. With gloves on the loops don’t feel tight or feel like they are pulling in to the hand. A comfortable loose fit to allow movement when needed. Between the jacket, a fleece and gloves you will be very warm and protected from the elements. I found the jacket wasn’t just for cold and dry weather. On a number of occasions, I have kept the SJ3 on with rain and fog and remained dry underneath thanks to the sleek, weatherproof design. While walking I could see the water just running off the jacket and much like the ML6 smock, padding the jacket down helped keep the worst of the water off. Although the jacket features YKK zippers across the body and provides protection and keeps you dry. I wouldn’t use this in heavy or prolonged rain and as for snow. I’m sure it will be suitable but moving up to the SJ6 or SJ9 would be better suited to keep the cold out. The Softie Jacket 3 is a good design, offering a sleek, fitted design for both men and women in this unisex style. The jacket is lightweight but doesn’t compromise on protection. I found I was very comfortable down to temperatures of -5 and when it was a little too much the combination of a fleece and the SJ3 was a perfect combination. I did find the hood was the only poor point on the jacket and found on its own was a little unreliable but used with a beanie or buff over the top to keep it down kept the wind off my neck. The SJ3 is the perfect companion for longer hikes and climbing given it’s lightweight and compact design. When packed in to the stuff sac it made a great pillow and took up little space in the rucksack. In early 2019 we saw snow across the UK. Wild camping and hiking in the snow can be hard work but also hot work. It’s easy to get to cold but equally very hot. The Snugpak SJ3 has proved very reliable for when walking up and down mountains in the snow, accompanied with the Snugpak Impact Fleece and when it proved particularly cold when stood still the SJ3 made a good mid layer below the Snugpak ML6 smock. As I mentioned above, the SJ3 doubled up as a great pillow and tucked inside my sleeping bag, I was very warm, comfortable and had a solid nights sleep from 8pm right through to 7am the following morning with heavy snow inside the Snugpak Ionosphere. Thicker Snugpak Jackets might had been better such as the SJ6 or even SJ9 but I wouldn’t want to layer with other items using these thicker jackets to avoid over heating and sweating which can freeze in the sub-zero conditions. A good base layer, Snugpak Impact Fleece, Snugpak SJ3 and a waterproof outer proved plenty!